I'm going to be adding some features in weeks to come and this is one of them. Some of you wonder what I read outside of the adventures of the Hulk and Spider-Man. You'll also be seeing some special indie features (one's coming very soon--sorry about the delay!). If you have any suggestions, or if you're a creator looking to get your own project out there, contact me at delusionalhonesty [at] gmail [dot] com & give me some lead time. I'd be happy to take a look! Meantime, let's start with one of last week's holdouts and continue on to some of this week's highlights. Fair warning: some of my reviews may contain SPOILERS, so read with care. My reviews will be summed up with four main classifications you can easily make sense of: Buy It (highly recommended), Read It (recommended), Skip It (unless it's a light week...), Burn It (a very special kind of hell). 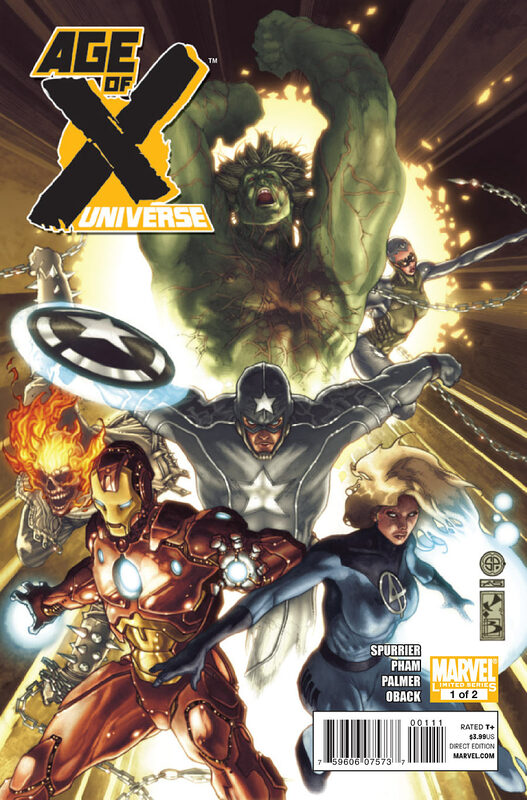 Back during the "Age of Apocalypse" storyline, there was a two-issue limited series, X Universe, that explored the lives of the human superheroes amid the background of the greater AoA arc. 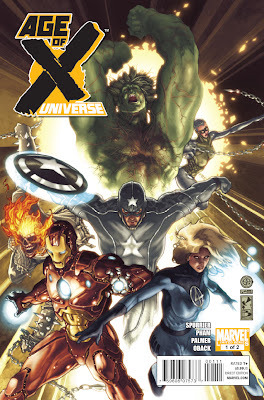 Of course, with the current Age of X arc conjuring memories of that epic storyline, why wouldn't Marvel try to echo that success with a story of a team of Avengers in this alternate reality? I'm not following Age of X, only this two-part series, so I can't speak for the quality of the remainder of the event. Si Spurrier offers up a script where the Avengers are government hunters of mutants under the direction of the man who is our Marvel Universe's Punisher. The characters in the story overwhelmingly reminded me of the Millar/Hitch "Ultimates," with a few changes in the lineup. The story makes it clear these aren't people who are comfortable working together. It's interesting if unnerving to see Captain America taking orders instead of giving them. The rest of the team is twisted in different ways, with the most jarring changes to the Hulk and Iron Man. We're supposed to bring the mainstream Marvel Universe's characterizations to the table as comparison here, but for me the whole picture never gels. I'm anxious to see if the next issue resolves or compounds my worries. This story may work well in the Age of X scheme, but by itself I'm unimpressed. Over the last year since Blackest Night ended and Brightest Day began, there have been hints that the major players were all symbols of elemental concepts DC has flirted with since the mid-1980s and the heyday of Alan Moore's Swamp Thing. 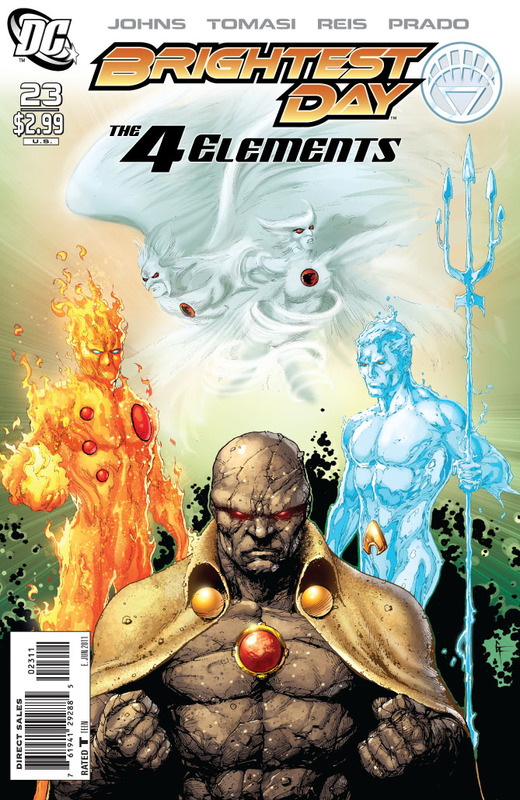 How fitting is it, then, that in the same issue where Johns and Tomasi bring the elemental undercurrent to the surface, they also return DC's original elemental--although in a very strange role? When you read the previous 22 issues altogether, you realize the elemental context was there all along, and to their credit, the creators bring the disparate elements together here in time for the big finale in two weeks' time. I am anxious to see the future plans for the elementals assembled in this issue, but don't exactly think a Primal Force revival is in the cards. However, with so many other characters having been embroiled in the main Brightest Day series (Hawk, Dove especially), I do wonder about their roles henceforth. With Johns' and Tomasi's script hitting its stride and bringing out all the elements that have been thoroughly seeded throughout all of the previous issues, I'm happy to say that artists Ivan Reis and Joe Prado have brought their artistic "A"-game to this issue. 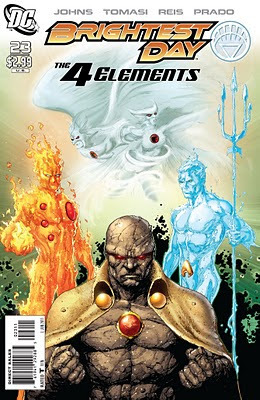 The elemental designs of the five main characters are well-done. Although I certainly wish to see them all restored to their previous looks in this saga, there's a definite purpose to the heroes all looking as they do. Their villain, the Black Lantern avatar, is also appropriately horrifying. This issue continues to tie up all the loose ends of the main storyline while clearly ramping up to the next major status quo, with an Aquaman series already announced and, unless I miss my guess, a Swamp Thing series also in the cards. Based on the last page of this issue, however, I'm a bit puzzled how DC plans to integrate the character's Moore-renovated origin. Alas, time will tell. Marvel's annual major event has begun, or rather, their annual line-wide crossover events have returned, as last year they divided their efforts in several "mini-events" of varying success. They've brought their current darling writer Matt Fraction (Invincible Iron Man, Thor, Casanova) together with terrific art talent Stuart Immonen (Ultimate Spider-Man, Nextwave, New Avengers) and one of the best colorists in the business, Laura Martin (Astonishing X-Men, New Avengers). They've created an incredible amount of incentive variant covers (including my favorite, by Paolo Rivera, above). The story ostensibly concerns a blending of recent plot elements from Fraction's Thor and Ed Brubaker's Captain America, heralding the arrival of the heretofore-unseen Norse God of Fear and the transformation of the Red Skull's daughter into its avatar, Skadi, possessed of a mystical hammer akin to Thor's. And the heroes of Earth tremble. Fear Itself is obviously set to mainly appeal to Captain America and Thor fans, and the reasons are obvious: after all, movies featuring both characters hit movie screens this summer. So far, Thor and Steve Rogers are the key focus, with the centerpiece being a formulaic father-son smiting between Odin and Thor that's really been done many, many times before and more tactfully. It's all set-up, this first issue, establishing the relationships between the primary protagonists and antagonists. It's well done enough, and very well-illustrated by Immonen and Martin, but set-up it remains. I'm anxious to see what occurs next month with the arrival of "The Worthy," don't get me wrong. (And yes, according to previews, one of those Worthy is one of my favorite characters, so I'll be watching with a very, very critical eye.) Right now, it's just another ramp-up to another major storyline that we've seen a million times before. And if you like that kind of thing, well, here's another one. The story still has plenty of room to improve in future issues, and knowing how terrific many of Fraction's stories have been in the past (I'm looking at you, Invincible Iron Man: World's Most Wanted) I'm definitely hopeful. You can bet I'll be watching this one as it develops, and bringing the latest to you. Hercules has certainly had an interesting year thus far, between the epic five-part miniseries Chaos War which stripped him of his godlike powers in his and the other Marvel heroes' clash with the Chaos King, and his guest appearances in the storyline's aftermath in The Incredible Hulks. 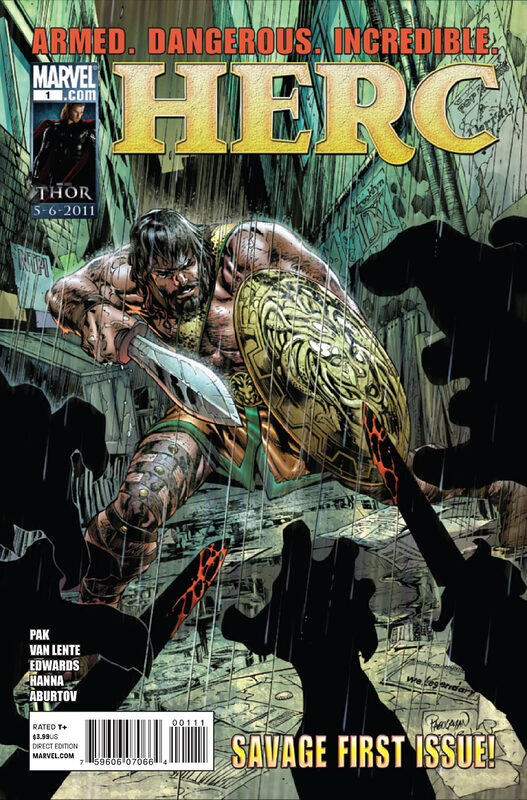 Greg Pak and Fred Van Lente have chosen to return to Hercules in this new regular series, this time without his partner from the previous series, Amadeus Cho. This time out, Hercules must rely on his wits and an arsenal of unusual weapons to combat evil on the streets of New York City. I was prepared for something different than what Pak and Van Lente offered in the previous series, but I'm not sure if I ever imagined something like this. The overt comedic tone that made the original Incredible Hercules series so endearing is largely absent, replaced by a grittiness that represents an incredible shift in tone I'm not sure I enjoy yet. Certainly the creators make it clear that Herc is a very different series than its predecessor, setting up the status quo in this issue, with Hercules adjusting to life being powerless, and getting a new job along the way. Now in a lower strength tier, Hercules fights similarly lesser-powered enemies, with the one at this story's end an interesting first pick. Despite my reservations about the story, I have no such reservations about Neil Edwards' terrific artwork. The entire book is lushly rendered, from Edwards' pencils, to Hanna's inks, on through to newcomer Jesus Aburtov's colors. The entire package is capped off with a well-deserved "Hercules Saga" feature, which encapsulates Herc's history in eight pages. Time will tell if Pak and Van Lente can catch lightning in a bottle twice, but I'm willing to stay aboard for a while longer. In the wake of "Planet Savage," the recent Incredible Hulks arc set in the Savage Land, the Hulk's savage son has remained among Ka-Zar, Shanna, and the other inhabitants of Marvel's Antarctic jungle, and now stars in his own miniseries by Marvel newcomers Rob Williams (Cla$$war, Shadowland: Ghost Rider) and Brian Ching (Incredible Hulks: Dark Son). The story appears poised to investigate the origins of the Savage Land, with Skaar encountering at least one Marvel mainstay from the 1970s. The storyline follows a few tracks, one of which includes Skaar in his exploration of his new home, another which centers on Ka-Zar's quarrel with the Savage Land's Council of Tribes, and yet another about a strange force with knowledge of the area's origins. Conspicuously absent from the storyline are all of the Warbound, who were left with Skaar at the end of last week's Incredible Hulks #625. Williams has a good feel for action and introduces all the characters well, providing some interesting moments between Skaar and Shanna (who didn't appear in "Planet Savage"). The set pieces, including Skaar's quarrels with two dinosaurs, are terrifically designed and pulled off with flourish by Brian Ching, whose work here is brighter and freer than in "Dark Son." While the story has many of the right elements for a story set in the Savage Land, I'm still not altogether sold on Skaar by Williams. Conceptually he has a firm handle on Skaar as a young character who, due to his strength and upbringing on Sakaar, often charges into situations he doesn't fully understand. However, much of Skaar's dialogue doesn't seem to fit, with only occasional snark that seemed to flow so easily under his creator, Greg Pak. But that's really a small gripe in an overall very solid debut issue, and I look forward to the next issue's imbroglio. Interesting reviews. I forgot that the new Skaar mini series came out this week. I know the Phantom Eagle will also be coming back in this series. Do you think that has any significance given the events of in Hulk 135? Or am I reading too much into that? Either way it it looks like it would be worth buying. 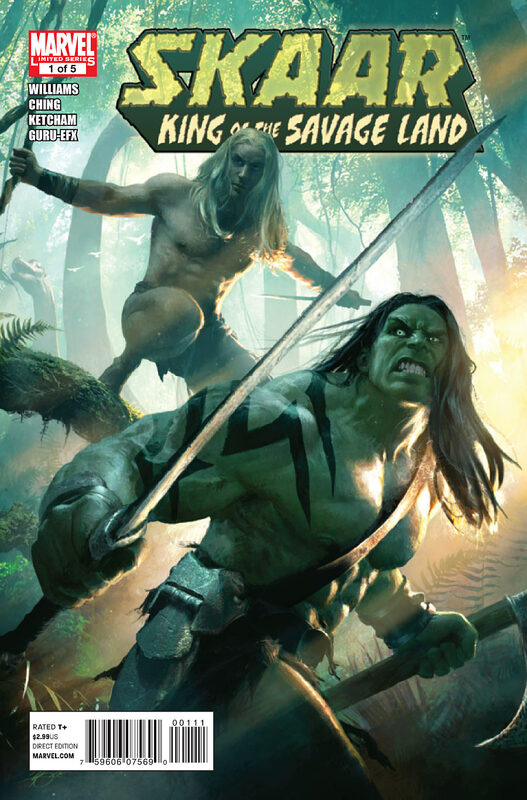 I really enjoyed the first issue of Skaar: King of the Savage Land, for it appears to be the beginning of a great storyline. Believe me, I would rather read about Skaar than Red Hulk, and I think most of us can agree that Skaar should get his own long running series. What I can't understand is why Skaar isn't going to be involved in Fear Itself, yet Red Hulk is? I would prefer seeing Skaar doing some smashing in Fear Itself, rather than Rulk. 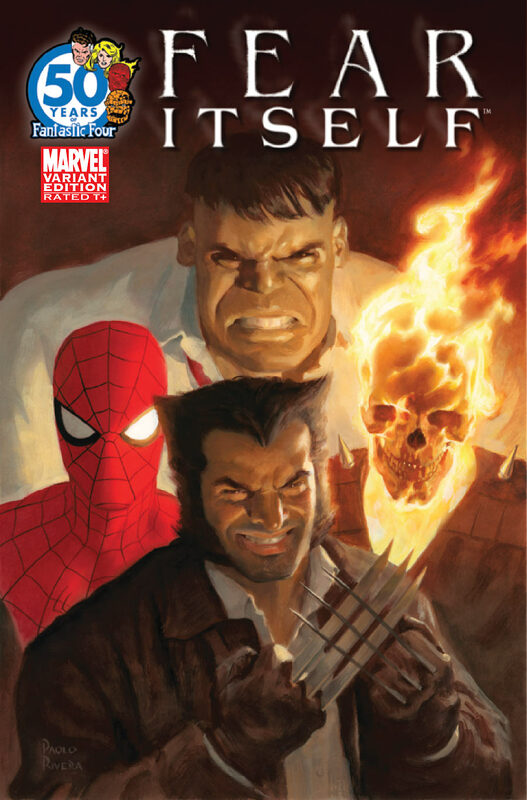 Speaking of Fear Itself, I found it to be a very solid and very entertaining issue. I honestly can't wait to see what happens in the coming issues, especially since Hulk is one of the Worthy. Though it does make me wonder if Fear Itself takes place before or after Greg Pak's Heart of the Monster arc. Herc #1 was also a very good read, with plenty of action and a little bit of humor. True, it's more gritty and darker than Incredible Hercules, but I think it'll do just fine. Can't wait to see Herc fight Hobgoblin in the next issue! Anyways, great reviews, Gary. Keep up the great work! I hope that that part of Hulk's/Banner's history is explored. Still think that Banner's grandfather that appeared in name only in that issue will turn out to be Brian Banner's father. PS The Skaar mini hasn't shipped this week but, the Hercules series has. It is really, really good!